Greek banks were expected to restart business on this day and that kept Bitcoin’s price under pressure all day long. As for my prediction from last week, the drop continued with the market price being down by 0.63%: it was trading at $276.09. This created a short opportunity after breaking the trendline. With a relatively flat market price throughout theday, the Histogram deprecated considerably to -3.5307 (from -0.9234). The MACD dropped to 7.7339, whereas the Signal Line remained at 11.2645. There was a sweeping drop of the Momentum indicator from 12.3300 to -9.1400. The MFI also dropped to 43.6596, its lowest value in one month. However, the RSI value showed some strength at 54.4129. 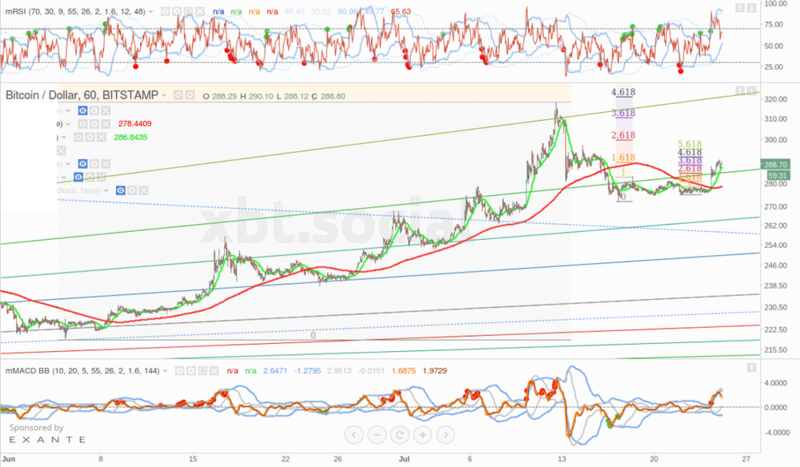 21/7/2015 – Bitcoin coaster up! The Bitcoin roller coaster finally picked up with a 1.3% rise on the price, as the market tried to break the resistance at last. There were signs of encouragement as the Greek banks started their Euro trading. Maybe the Bitcoin market price rise was an expectation due to the rising in the number of Greeks converting their Euros into BTC. Bitcoin was trading at $279.69 with a low-risk trading chances for the participants. Still, the MACD and Signal Line kept dropping with values of 7.4287 10.6422, respectively. There was no indication of a turnaround in the Histogram with a value of -3.2135. The Momentum indicator was also against the price with a succumbed value of -11.9500. At this point, the price rally was likely to be a deception. The MFI tried to recover with a value up to 49.3538. The RSI remained relatively flat at 56.6387. 22/7/2015 – Bitcoin coaster down! All the analysis from the previous day showed the anomaly between the technical analysis and the actual Bitcoin market. It proved critical as the market price dropped by 1.32% and Bitcoin was trading at $275.99. The MACD continued to slide and had a value of 6.4500. The Signal Line steadied a bit at 9.8195. The Histogram remained in the negative zone with a value of -3.3694. Although the price was steady and sitting comfortably near the resistance, the momentum decline continued with a price drop from 13.9200 to -34.5600. The MFI value dropped a bit to 47.0825 with the RSI value sitting at 53.8095. After two ‘roller coaster’ day, the Bitcoin price held steady in the upper side with a 0.70% increase to $277.94. The Histogram gained some momentum as well with a value of -2.9722. Signal Line and MACD had a value of 9.0247 and 6.0525. The momentum picked up; from -34.5600 to -14.7400. The MFI built steady progress to 48.8019. The RSI value started showing some strength at 55.2524. It had been a dull couple of days for the so-called “volatile” Bitcoin and the price remained the same with a gradual decrease of 0.52%, while trading at $276.49. The MACD and the Signal Line maintained positive values of 5.3689 and 8.1852, respectively. The Histogram remained below zero at -2.8163 with the Momentum keeping the cryptocurrency in the negative zone at -11.0600. The MFI dropped to 41.6739, but the RSI remained constant at 54.0214. So much for a steady finish during the weekend, as Bitcoin registered a steep rise. The market price increased by five percent and was trading at $289. The price is expected to remain flat around $286. The price is expected to be stable at the start of the week, unless something dramatic happens. If any movements happen, bets are they will happen on the down side. According to Coinbase, the price will take drastic fall at the beginning of the next week, possible dropping below $275. The Bitstamp indicator is suggesting a steady start of the week for Bitcoin with the market price hovering around $290. It would be wise to just play cautious until a more opportune moment arrives since there were no clear uphill or downhill targets.